Heat an oven to 175 degrees. crush the biscuits and add the melted butter to it. Press it into the bottom of a spring form pan to make a base. Press it firmly and refrigerate for an hour. Mix the thick yogurt with the condensed milk well. Pour it gently and carefully on top of the biscuit layer. Place in the oven and bake for 15 minutes. Cool completely (very important) and then refigerate for an hour. For the strawberry jam topping : Heat the strawberry jam ( if its from the fridge) and cool it a bit. Top it over the cake and make swirls with a fork to create a fancy design. FOR THE CHOCOLATE SAUCE: melt the chocolate bar over a double boiler , add a little cream and some icing sugar to taste. Cool it a bit and pour over the cake!! This entry was posted in A Piece of Cake?? 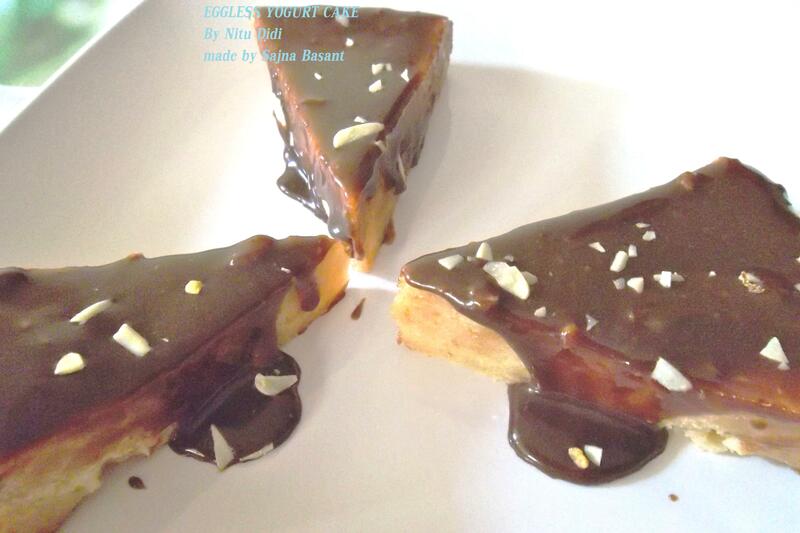 ?, Eggless Sweet Temptations, Everything Vegetarian, Low Cost and tagged eggless yogurt cake, yogurt cake. Bookmark the permalink.